Contact the C/U representative at the C/U partner near you. Don’t know who that is? 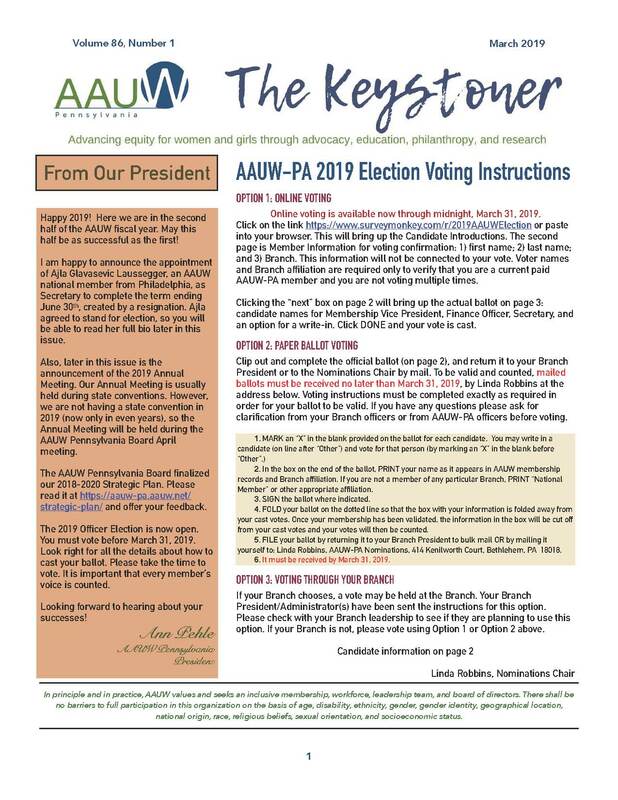 Contact the AAUW-PA C/U liaison, who can tell you. Offer your branch resources and investigate shared concerns and opportunities. Encourage students to join your branch and the state as well as affiliating with national. There are myriad options. Think creatively and talk with the students or the C/U representatives about their concerns and interests and what is feasible on their campus. Pay equity activities: host an Equal Pay Day bake sale, collect signatures to support pay-equity legislation, sponsor speakers on negotiation skills, etc. A speaker or panel on an AAUW issue hosted by your branch. Want to know more about these? Contact the AAUW-PA C/U liaison, who can tell you. For additional ideas, go to Student Organizations. Note: C/U partners (those colleges and universities that are members of AAUW) receive 15% off the registration fees if a group of 4 or more students register as a group. Find out whether your college or university is a member. To support the general operating funds for the conference or make a donation to the scholarship fund, contribute online at Donate to AAUW Today. To make a donation to the general operating funds for the conference, select Leadership Programs Fund. Such efforts could be the start of many successful partnerships, leading perhaps to a new C/U partnership, a new Student Organization at your local C/U, or a branch Emerging Leader Intern. Contact the AAUW-PA College/University Liaison for further information. Each year, several students from Pennsylvania universities and colleges or residing in Pennsylvania attend NCCWSL, enjoy learning skills that will last them a lifetime, and agree to share their experiences. Work with you to start an AAUW Student Organization or to support an existing AAUW-PA Student Organization.